We don’t know if the NFL will act on a letter from activist-players in August seeking substantial support from the league in their efforts to push for racial equality and criminal justice reform. But what has been apparent for weeks, and comes into even sharper focus in light of players seeking a partnership with ownership, is that the still-evolving movement is rapidly entering a new phase. The memo that a group of four players sent the NFL last month, according to Yahoo! Sports, indicates that leaders of the nonviolent process in the nation’s most popular sport believe it’s time the NFL does much more than merely acknowledge their right to protest. They’ve requested that the league not only dedicate a month to social activism, in the same manner that it annually dedicates time to other causes it deems worthy, but also make a significant financial commitment to the work its on-field employees are doing to uplift black and brown people in the United States. The 2,740-word document was co-authored by four of the men who have been on the front lines of the fight that former San Francisco 49ers quarterback Colin Kaepernick started last season: Seattle Seahawks defensive end Michael Bennett, Philadelphia Eagles safety Malcolm Jenkins and wide receiver Torrey Smith, and former Arizona Cardinals wideout Anquan Boldin. It’s not surprising that those four were willing to put their names on something that challenges the highest-ranking league officials, including commissioner Roger Goodell, and owners to get off the sidelines and fully engage in a battle of right vs. wrong. “We would like November to serve as a month of Unity for individual teams to engage and impact the community in their market,” the memo states. In pushing for the commissioner’s office and owners to back their efforts “similarly to what the league already implements for breast cancer awareness, honoring military, etc.,” Bennett, Boldin, Jenkins and Smith have essentially called out the league for failing to take any steps to truly support them in addressing issues among the most important facing the nation. “For us, support means: bear all or part of the weight of; hold up; give assistance to, especially financially; enable to function or act. We need support, collaboration and partnerships to achieve our goal of strengthening the community,” the document stated. The league received the letter shortly after Goodell spoke directly with several players who had protested on game day before the regular season kicked off, the Yahoo! Sports report stated, according to sources. 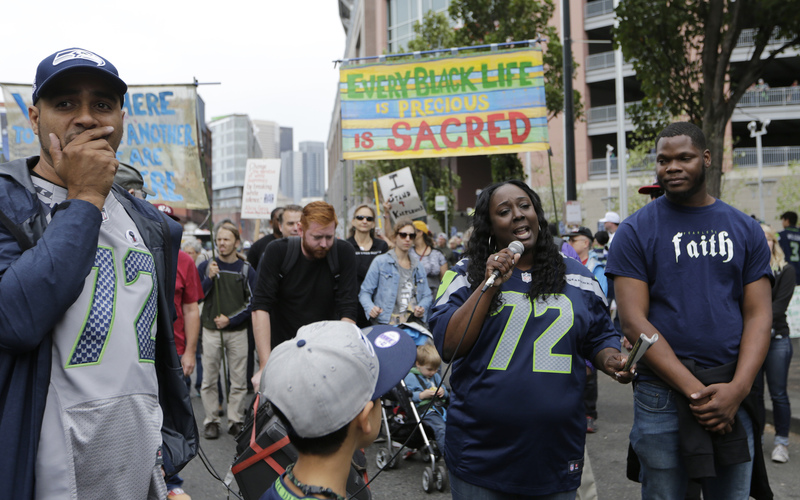 Katrina Johnson, second from right, speaks outside CenturyLink Field after taking part in a march supporting Black Lives Matter and other social causes before an NFL football game between the Seattle Seahawks and the San Francisco 49ers on Sunday, Sept. 17, 2017, in Seattle. Johnson is wearing the No. 72 jersey of Seahawks defensive end Michael Bennett, who reached out to her family after Johnson’s cousin, Charleena Lyles, was fatally shot by Seattle police earlier in the year. The memo is the natural next step in a matter extremely important to many players. Almost 70 percent of the NFL’s players are black, so it would stand to reason that the overwhelming majority of players believe they have a personal stake in issues that adversely affect black folks. Some NFL players have been hoping the league would soon become substantively engaged in an issue they’re willing to risk their careers over. Entering Week 3 of the season, Kaepernick, an accomplished free-agent quarterback, still remains unsigned after he sat and then kneeled during the national anthem last season to draw attention to the oppression of black people and people of color in the United States. The belief among civil rights activists and a growing number within the NFL, both black and white, is that Kaepernick has been blackballed because his politics are not the politics of owners. This season, Bennett has become the new face of unprecedented political activism among NFL players. Activists and fellow players have rallied around Bennett after his recent harrowing encounter with police. It was Bennett who initially called for white players to back their African-American teammates in anthem protests, arguing that the show of support could change opinions of those who believe Kaepernick and others were focusing only on “black issues.” Philadelphia Eagles defensive end Chris Long became the first white player to answer the call, and others have followed. Twelve Cleveland Browns players, including the first white player, took a knee during the preseason. With racial tension high in the U.S., the NFL has tried to walk a tightrope. League officials are balancing the players’ rights to protest during the anthem, which is not prohibited under the NFL’s collective bargaining agreement, with concerns about alienating sponsors and fans. But there often comes a time when organizations have to pick a side. For the NFL, it seems that time is now.